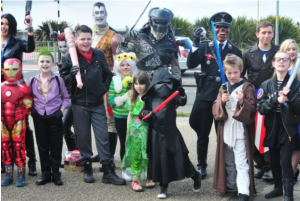 Morecambe Comic-Con was a huge success this Easter Monday with around 1,500 visitors to the event at the Platform. Gary Jones, an organiser of this year’s Comic-Con, commented that he was pleasantly surprised with the high turnout and felt that the great weather added its success. Sci-fi fans arrived in a variety of costumers, from Captain Jack Sparrow to Pearl from American animation Steven Universe. There was even a remote controlled R2-D2 that took its owner, Darren Poulson, four years to build with help from the national R2-D2 builders group. Sound like fun? Make sure to put the next Morecambe Comic-Con in your diary! On August 28th this event will be returning, complete with an inflatable outdoor gazebo!